Gail Dennise Mathieu, a career member of the Senior Foreign Service, was appointed United States Ambassador to Niger by President George W. Bush in 2002. 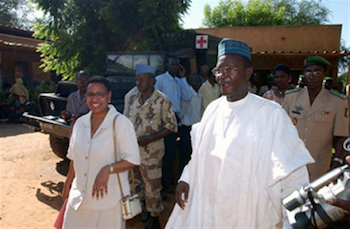 She remained in Niamey, the capital until 2005. In 2007 President Bush appointed her United States Ambassador to Namibia. Between these appointments she was Director of the Office of Technical Specialized Agencies in the Bureau of International Organization Affairs. She assumed her current position of Deputy Assistant Secretary for Australia, New Zealand, and Pacific Island Affairs on August 19, 2013. A native of New Jersey, Ambassador Mathieu grew up in multi-cultural neighborhoods in Newark and Westfield. These experiences inspired a life-long interest in foreign countries and languages, and an appreciation of diverse points of view. She graduated from Antioch College in 1973 with a Bachelor’s degree in Spanish and Latin American Studies then went on to obtain a Juris Doctor degree from Rutgers University School of Law in 1976. She also attended The Johns Hopkins School of Advanced International Studies. She was an assistant prosecutor for the city of Newark, New Jersey and is a member of the New Jersey and District of Columbia (Washington, D.C.) bars. She married Erick Mathieu and they have one son. Mathieu joined the Foreign Service in 1978 and began her diplomatic career. She served as Deputy Office Director of West African Affairs from 1997-1999, and as the Deputy Director Pacific Islands Affairs from 1995-1997. Previously, she served as the U.S. Observer to UNESCO. Her overseas assignments have taken her to U.S. Embassies and Missions in Geneva, Switzerland, Jeddah, Saudi Arabia, Paris, France, Port of Spain, Trinidad and Tobago, and Santo Domingo, the Dominican Republic. Just before her appointment as Ambassador to Niger, Mathieu was Deputy Chief of Mission in Accra, Ghana where she oversaw all aspects of Embassy operations. Mathieu served in Niger during a severe drought. Even in “normal” times two-thirds of the population lived on less than one dollar a day and 40% of the children showed signs of malnutrition. Niger was rated the second poorest country in the world when she was assigned there and experienced “chronic food insecurity.” Mathieu urged donors and governments to look beyond responding to emergencies and worked toward having the United States encourage trade between the two nations which would, she believed, play a major role in transforming Niger’s weak economic and agricultural sector. While in Namibia her main goals included strengthening primary democratic institutions and respect for human rights, combating HIV/AIDS, and promoting economic growth and prosperity. Ambassador Mathieu is the recipient of the Chairman of the Joint Chiefs of Staff Distinguished Civilian Service Award, the Presidential Meritorious Service Award, and several other Superior and Meritorious awards. United States Department of State, http://www.state.gov/r/pa/ei/biog/bureau/213499.htm; AllGov, http://www.allgov.com/officials/mathieu-gail?officialid=29108; Antiochian Fall 2004, http://antiochdocs.antiochians.org/antiochian/archive/Antiochian_2004fall/alumni/classnotes.html#2000.